Vivo could soon be entering the record books as it teases a mysterious 3.85mm thick smartphone. It looks like Vivo has a super-slim smartphone in the pipeline that could set the bar for thin handsets. The Chinese company shared images of the 3.85mm-thick phone on Weibo posed next to the 7.6mm-thick iPhone 5s. The comparison shows the mystery blower is half as thick as the Apple device, with two of them stacking up to make up the difference. 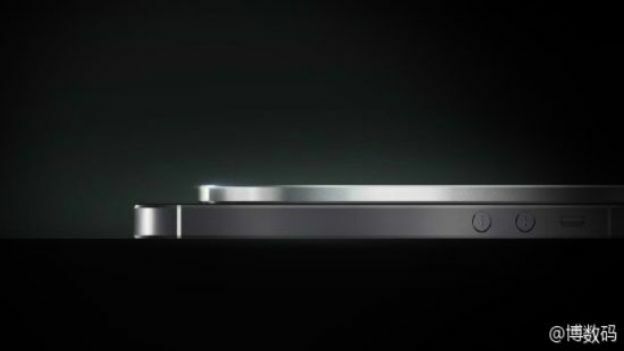 Whenever the stick-thin phone arrives, it will trump the recently released world's thinnest phone – the 4.5mm-thick Oppo R5. It's certainly a rather ludicrous concept, although Vivo has pulled off the ground-breaking before. The company was the first in the world to deliver a phone with a 2K 2560 x 1440 screen, so despite being relatively unheard of it's experienced in trying new things. However a phone that thin really does sacrifice any decent specs. The Oppo R5 is a prime example as its skinny build couldn't even fit a 3.5mm headphone socket. Apple's bendgate fiasco also surely raises concerns about potential bending and warping. If the 7.1mm-thick iPhone 6 Plus suffers because of its slim stature, then expect Vivo's 3.85mm-thick device to come across the same problems. That's all for now, but stay tuned for more on the mystery phone.